Gantrade offers an array of organofunctional silanes for application in diverse settings, from the oilfield to paint & coatings. These organofunctional silanes are extremely versatile reactive intermediates, widely employed in coatings, adhesives, sealants & elastomers (CASE), inks, and related applications. Selecting the optimal organofunctional silane for your application will be dependant on the resin or polymeric material involved, the inorganic filler or substrate and the processing conditions of the application. Gantrade can help to guide you through the section process and associated application technology. Coupling of dissimilar materials is the predominant application for organofunctional silanes in polymers, while waterproofing of cementitious materials and water repellency are the major applications for alkyl silanes. The overall effect is to improve the mechanical strength of composite materials, increase adhesion and dispersity, and improve moisture resistance, etc. Let’s take a look at some of the fundamentals of silane chemistry and the selection criteria for various applications. Gantrade offers a wide range of organofunctional silanes that impart unique attributes for the applications delineated above. 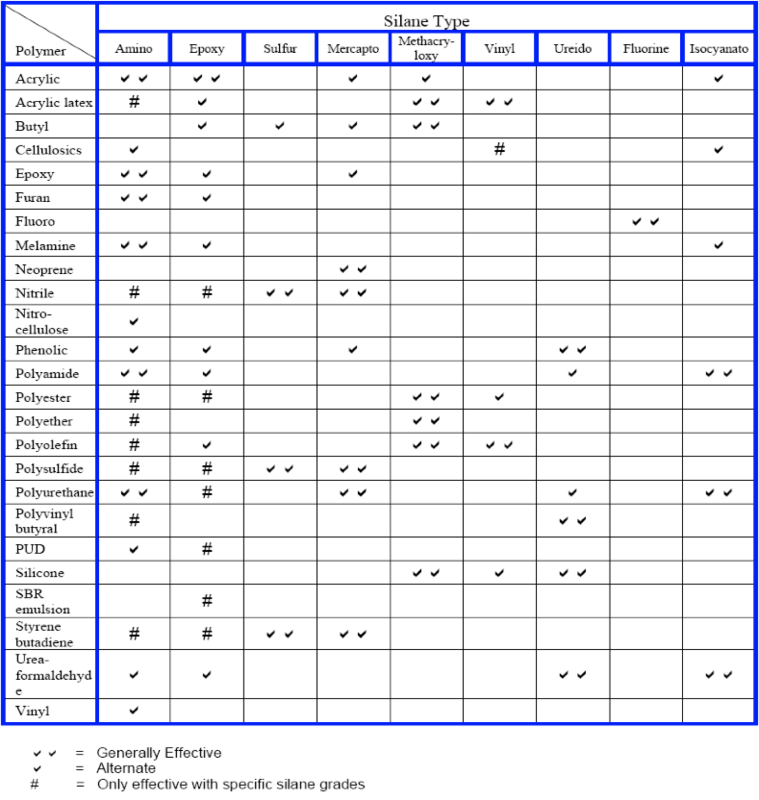 Users apply our organofunctional silanes by integrally blending them into formulations where the organic and inorganic materials are already mixed together, copolymerizing them into acrylic or vinyl acrylic polymers, grafting onto polymers, using them directly as surface treatments or primers, or pre-compound them with fillers. Generally, the starting organofunctional silane use level is 0.2 – 1.0 %, although we have used levels of the silanes up to 2 %, depending on the type and concentration of fillers. Non-hydrolyzable organofunctional or vinyl moieties on the Si atom that react with other functionality on organic polymeric materials such as epoxides, carboxylic acids or amines, to build durable covalent bonds. Hydrolyzable silane moieties, such as silyl esters, form a reactive silanol group which condenses with surface hydroxyl groups on fillers or other siloxane moieties to form siloxane -Si-O-Si- linkages. Through drying, they create multiple chemical bonds that form strong attachments to inorganic surfaces. X – three moisture hydrolyzable groups, typically an alkoxy (methoxy or ethoxy), which form chemical bonds with inorganic materials such as glass, minerals, etc. Hydrolysis of the alkoxy-silanes may result from multiple sources of adventitious water, such as moisture in the integral mixture or surface water, added water or absorption from the atmosphere, or water of reaction. The rate of acid-catalyzed hydrolysis is significantly faster than under basic conditions. With the exception of amino-silane systems, users deploy most silanes in surface treatment application under acidic conditions or metal-catalyzed systems. Note also that the rate of methoxy silyl esters hydrolysis is about six to ten times faster than the rate of hydrolysis of ethoxy silyl esters. Users generally attribute this dynamic to the steric bulk of the alkoxy ester moiety. Finally, methoxy-silanes hydrolyze to produce methanol, while ethoxy silanes release ethanol, a more toxicologically friendly side-product. Silyl esters most effectively couple with inorganic materials having higher concentrations of active hydroxyl moieties on their surfaces. Silica, sand, glass, alumina, talc, clay, mica and metal surfaces such as steel, are examples of inorganic materials with higher concentrations of active hydroxyl surface functionality. End-modification of polyurethane via silane functionality occurs using either isocyanatosilanes or amino-functional silanes. Isocyanatosilanes are expensive agents, so amino-silanes offer the most cost effective approach to silane modification. Through direct reaction with a diisocyanate or with an isocyanate polymer, the amino-silane can form a urea linkage and a silyl ester terminate polyurethane. Optionally, users may also pre-treat filler or surfaces with an amino-functional silane prior to compounding with a resin or coating a surface. The improvements in the interfacial strength enable better properties like adhesion, abrasion resistance, durability and mechanical strength. Also of note is that manufacturers may also utilize ureidosilanes to functionalize the end-groups of polyurethanes through the formation of biurets linkages. Catalysts like tetrabutylititanate (TNBT) or dibutyltin dilaurate (DBTDL) increase reaction rates with silyl ester-terminated polyurethanes that moisture-cure in the presence of water or moisture to afford a crosslinked system. Crosslinking improves mechanical properties, durability, weatherability, abrasion and cut resistance. Both aminofunctional and glycidoxy functional silanes are the preferred organofunctional silanes in epoxy systems such as bisphenol A and bisphenol F diglycidyl ethers. Users may blend organofunctional silanes into an epoxy resin or employ them by pretreating a filler or surface. Manufacturers may also integrally blend the silane into the compound containing the epoxy resin and the filler, glass reinforcement, or the surface to be coupled. Silane coupling agents improve adhesive properties and mechanical strength and improve dispersity of fillers. Manufacturers most often copolymerize methacryloxypropyl silanes in acrylic and methacrylic systems, as well as styrenic systems such as with Unsaturated Polyester Resins (UPRs). They achieve this copolymerization by adding the bi-functional silanes to the monomer feed mix. Vinyltrimethoxysilane, most often copolymerized in vinyl acrylic systems or through free radical grafting technology onto polyolefins, is also commonly used as a moisture scavenger in sealant and adhesive formulations. Silane modification can also be accomplished by adding aminosilanes to an acrylic emulsion under neutral and ambient conditions. Diamino-silanes are often used because they show better water solubility. Epoxy silanes are an alternative for the chemical modification of acrylic systems having functionality that reacts with epoxy moieties. The silyl ester-modified polymers exhibit improved dispersibility and interfacial strength with mineral fillers, better weathering characteristics, improved mechanical properties, and better adhesive characteristics. Users may also moisture cure the silyl ester-modified polymer or improve adhesion to surfaces. Silyl ester modification of polymers improve mechanical properties in paint and coatings, water, scrub, and abrasive resistance, gloss retention and wet adhesion. This process also improves blister resistance, as well as block resistance and stain removal. Manufacturers use sulfo silane coupling agents in silica reinforced SBR, BR, and natural rubber tire compounds to bridge the dissimilarity of the silica with the hydrocarbon rubber. They accomplish this by having the silyl ester portion of the coupling agent bond to the silica surface while the sulfo portion of the silane is grafted through the unsaturation in the hydrocarbon rubber. Silica-reinforced green tire compounds exhibit low hysteresis (heat generation) and reduce rolling resistance, thereby contributing to fuel economy. Applications of phenolic resins include glass, sand and mineral-reinforced compounds, fiberglass laminates, foundry resins, and proppants as described below. Manufacturers use both epoxy functional and amino functional silanes with phenolic resin compounds. These organofunctional silanes couple the novolac or resol resin to the inorganic substrate, affording improvements in mechanical strength, durability, adhesive properties, and environmental resistance (humidity, heat, and more). In the oilfield, operators fracture the producing oil field formation open using hydraulic pressure and then pump propping agents into the formation with fracturing fluid to hold the fissures open. Proppant suppliers coat sand and ceramic proppants with phenolic, epoxy, or polyurethane resins for these fracturing and stimulation operations. The coatings improve proppant crush resistance and packing properties and increase the load-bearing capacity for long-term fracture conductivity (gas and crude oil flow). Silane coupling agents are used to promote adhesion of the resins to the sand or ceramics, and deliver durability in the harsh environments of the oil field formation (temperature, pressure and chemical resistance). Contact Gantrade to learn more about our selection of silanes and how they can strengthen your products for better adhesion, filler dispersity, and much more.